Don’t you just love a higgledy-piggledy gate? This charming cottage looks as though it’s been loved by generations of family members. The huge hemlock hedge protects it from the street—but also makes getting a great photo a bit of a challenge. The house is a series of small cottages and a main house all joined together by porches, pergolas and covered walkways. They sit together on a street corner with a mountain view to boot—and best of all, downtown is just a short walk away. A second gate and light post lead to a charming barn and shed. Imagine spending warm summer days and cool summer evenings here. Take a peek and enjoy! 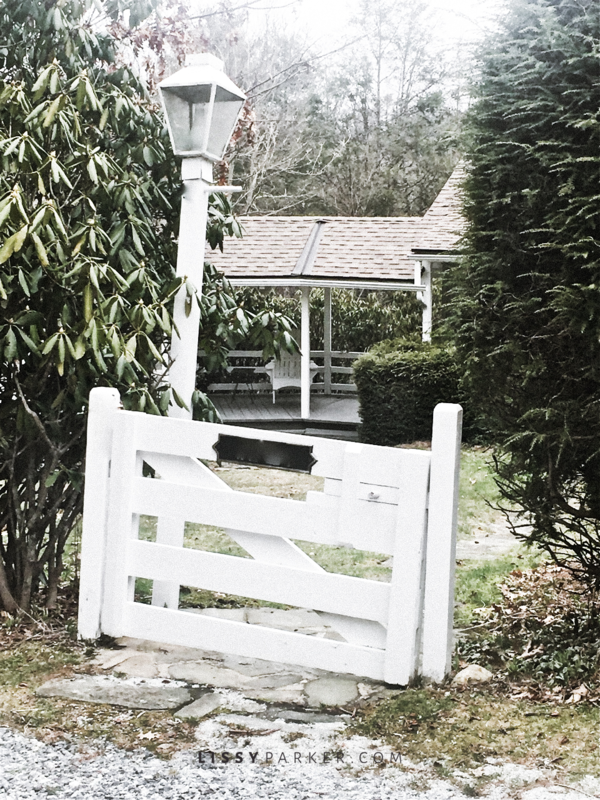 Such a charming little gate! This porch connects the main house and quest house. A tiny stone path leads to the door. This scalloped trim surrounds the windows—so very cute. A second gate leads to another porch and shed. Here’s another porch surrounded by hemlock with a mountain view. And finally—the cutest garden shed ever!